Today's New York Daily News: We Are Fucked - Joe.My.God. 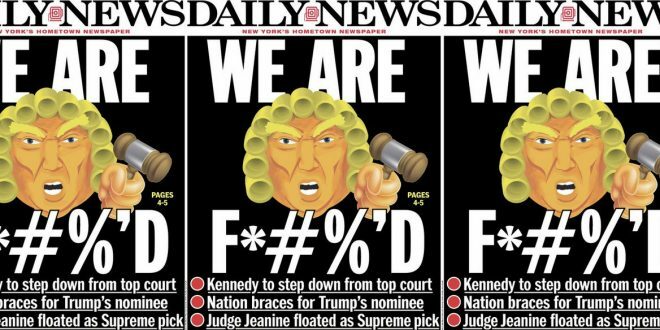 The New York Daily News needed only three words for its Thursday cover focusing on Supreme Court Justice Anthony Kennedy’s retirement: “We Are F*#%’D.” The 81-year-old jurist announced Wednesday that he would be retiring at the end of July, after 30 years on the court. His departure gives President Donald Trump the opportunity to nominate a second more solidly conservative Supreme Court justice in one term, further cementing the bench’s rightward leanings and shaping the court for decades.